If you are a fan of Mac tips and tricks and customizing OS X, you absolutely have to get TinkerTool for Lion. 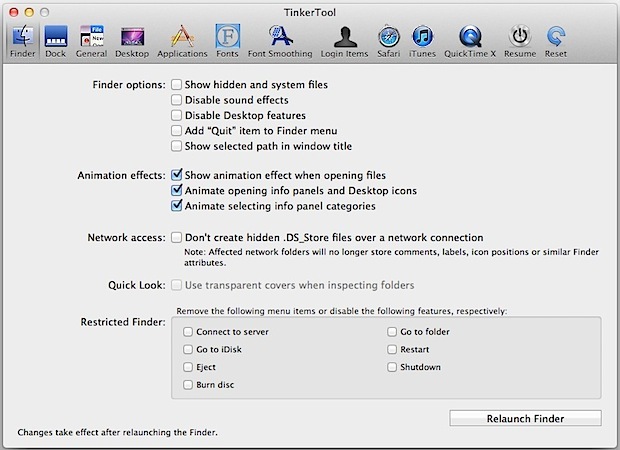 TinkerTool is broken into 12 main sections covering Finder, Dock, General, Desktop, Applications, Fonts, Font Smoothing, Login Items, Safari, iTunes, QuickTime X, and Resume (OS X Lion’s Restore feature), each section has a handful of options ranging from UI tweaks to behavioral changes. The other great thing is that you can always return to the default state and undo all the changes you make, meaning there’s no threat of accidentally screwing something up. A free download, the new version is updated with a ton of OS X Lion specific tweaks and customizations, adding to it’s already robust abilities. It covers tons of things we’ve discussed here in the past, and everything is enabled through the apps simple GUI by just clicking on checkboxes. No defaults write commands, no digging around in /System/Library/CoreServices/, it’s by far the easiest way to access many of the hidden features of Mac OS X. If there’s only one app you get for customizing OS X, TinkerTool should be it. No .DS_store files on my file server and my dropbox anymore; thanks! I have no certainty yet that it’s related, but the last thing i did before my mbp coulnd’t start up again was changing the system fonts with tinker tool. Now trying to revert using command line but couldn’t yet. I don’t feel like reinstalling my system just for that. Seeing the OS so fragile made me lose a bit of faith in Apple… but I reinstalled my Lion and amazingly, it made me los icon disposition, find preferences and user login items… and that’s all! All my apps, my pictures, my projects, everything, is there. Impressive.